The Clan Sutherland Society in Scotland was founded in 1897 and reconstituted in 1977. The Clan crest is the cat salient proper, the Clan motto is Sans Peur, the Clan emblem is butchers broom and the Clan pipe music is the Earl of Sutherland's March. Some authorities regard the families of Cheyne, Federith, Gray, Oliphant, Mowat and a branch of the Keiths as historically associated with the Clan. It now has members in all parts of the United Kingdom, USA, Canada, Australia, New Zealand, The Netherlands, Belgium, Switzerland, South Africa, Eire, France, Austria and Italy. Promoting the conservation and the preservation of places and objects connected with Clan Sutherland. Encouraging research into the history of the clan. Greetings from the Chief of the Clan. 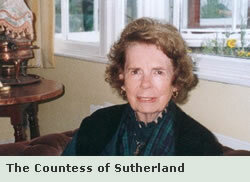 "I am so glad that the Clan Sutherland Society in Scotland has decided to establish its own website on the internet. The purpose of the site will be to give our current members information about the Society and its activities. In this way the CSSS will be in closer touch with members of the Clan Sutherland overseas and the website should encourage new memberships of their societies and ours in Scotland. So greetings to all concerned; and my very best wishes"